To Béal Atha’n Ghaorthaidh went the bragging rights at the end of this Muskerry dearbaí, a victory made all the more impressive when you consider the winners played the closing quarter of an hour with 14 men. 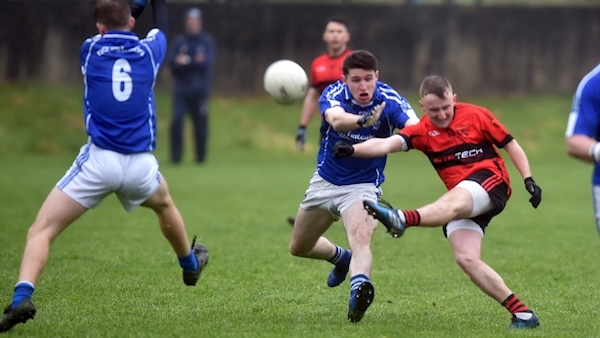 Backed by the elements in the opening half of yesterday’s first-round tie, Naomh Abán, who reached the semi-finals of the Cork PIFC last year, where they fell by the minimum to eventual champions Fermoy, led by 1-7 to 0-7 at the break. Their opponents didn’t fare half as well last season and wound up in a relegation playoff following back-to-back championship reverses. Their league form this spring, as well, hasn’t been anything to shout about – not a single win accrued after five Division 1 games. But as Béal Atha’n Ghaorthaidh selector Éamonn Ryan remarked afterwards (this the Éamonn Ryan who steered the Cork ladies to 10 All-Ireland titles in 11 years), every game is different. So too is every season. 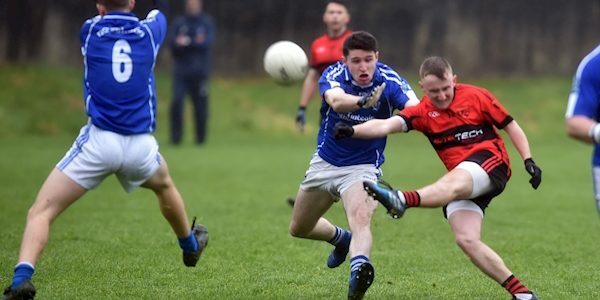 Making light of their recent run of defeats, Béal Atha’n Ghaorthaidh turned in a fine second-half display, during which they held their neighbouring Gaeltacht club scoreless from play, to run out comfortable six point winners. Aindrias Ó Coinceannáin (free) and second-half subs Crothuir Ó Loingsigh and Colmán Ó Tuama kicked three on the bounce to haul Béal Atha’n Ghaorthaidh back on level terms 12 minutes into the second-half. But then disaster struck. Ó Tuama, following a reckless high challenge on Dara Ó Loingsigh, saw red. Beál Atha’n Ghaorthaidh down to 14 men. Naomh Abán, with their first score of the second-half on 47 minutes, moved back in front through a Maidhc Ó Duinnín free. But they’d not raise another flag until the 59th minute, by which juncture the game had gone away from them. A key turning point in this local derby was Aindrias Ó Coinceannáin’s 55th minute penalty, which came about following a foul on midfielder Matt Ó Riordáin. The converted spot kick moved Béal Atha’n Ghaorthaidh 1-10 to 1-8 in front. There followed back-to-back white flags from Diarmuid Mac Tomais. All of a sudden, the men from Ballingeary were four to the good. Maidhc Ó Duinnín closed the gap somewhat with his third free, but the result was wrapped up when Mac Tomais found the net in injury-time for a second Béal Atha’n Ghaorthaidh goal. “They did respond tremendously well to the sending off,” said Éamonn Ryan. Basically, they stopped thinking about it and went and did it. They are very good footballers. The last quarter of an hour was very pleasing. That the winners were still alive in the contest come the interval break had much to do with the outstanding display turned in by goalkeeper Gearóid Ó Muirthuile. Although beaten by Ballyvourney’s Conor Ó Críodáin eight minutes in, the Ballingeary number one proceeded to produce three fine saves. The first was a vital flick to knock the ball away from Ó Críodáin as a second Naomh Abán goal loomed large; he tipped over a Maidhc Ó Duinnín drive, and later in the half repelled an Aodán Ó Luasa shot. Even in the second-half, Ó Muirthuile was still producing heroics, making two further stops. The more impressive was his save to keep out a Simon Ó Murchú drive. All told, this was a real collective effort from Béal Atha’n Ghaorthaidh, the victory also moving them within one game of representing the Muskerry Gaeltacht at Comórtas Peile na Gaeltachta in June. A fine afternoon’s work. Scorers for Naomh Abán: M Ó Duinnín (0-4, 0-3 frees); C Ó Críodáin (1-0); D Ó Ceallaigh (0-3, 0-2 frees); D Ó hAileamháin (0-1 ‘45), M Ó Liatháin (0-1 each). Béal Atha’n Ghaorthaidh: G Ó Muirthuile; C Ó Noonáin, S Ó Donochú, N Ó Laoighre; D Ó Ceallacháin, L Ó Conchúir, A Ó Loingsigh; E Ó Coill, M Ó Riordáin; D Seartan, C Ó Duinnín, S Ó Tuama; D MacTomais, A Ó Coinceannáin, E Ó Duinnín. Subs: C Ó Tuama for E Ó Duinnín (HT); C Ó Loingsigh for Ó Noonáin (42). Naomh Abán: M Ó Donnchú; R de hÍde, C Ó Deasúna, T Ó hAileasa; D Ó Loingsigh, C de hÍde, D Ó Scanaill; C Ó Murchú, E Ó Críodáin; C Ó Críodáin, M Ó Duinnín, M Ó Liatháin; D Ó Ceallaigh, D Ó hAileamháin, A Ó Luasa. Subs: S Ó Murchú for Ó Críodáin (34 mins, bc); P Ó Liatháin for Ó Loingsigh (52, inj); S Ó Riada for Murchú (55, bc).